Craig Ellwood, “the Cary Grant of architecture,” was one of the most visible faces of California mid-century modernism. He was known as much for his exquisitely designed, minimalist structures as he was for his exuberant lifestyle. This book celebrates and explores the glamour of Ellwood’s work, life, myth, and career. 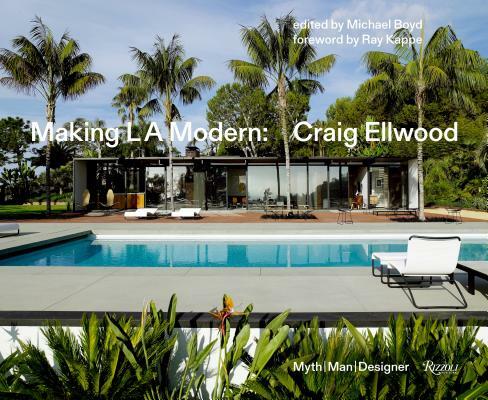 Through photographs, primarily of the iconic houses he designed in Southern California during the 1950s and ’60s, we see a life of refined decadence, expressed through gorgeous architecture, fast cars, beautiful women, Hollywood style, palm trees, swimming pools, and minimalist design—all in the context of the Southern California postwar building boom. This volume will appeal to design junkies, architecture buffs, students of modernism, and anyone interested in problem-solving and elegant solutions. Michael Boyd, a designer based in Los Angeles and San Francisco, is a renowned and published expert on twentieth-century design and postwar modernism. Richard Powers is a widely published photographer whose books include Rizzoli’s Making House. Ray Kappe is an internationally recognized architect, urban planner, and educator and is a cofounder of SCI-Arc in Los Angeles.